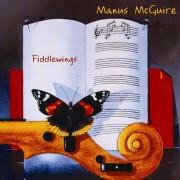 Growing up in Sligo in the 1960s when fiddle music had regained popularity in its native home, the Northwest of Ireland, Manus McGuire was ideally placed to carry on a tradition made legend by fiddlers Michael Coleman, James Morrison, and Paddy Killoran thirty years previously. From an early age he learned various dance tunes by his father’s knee and followed his older brother, Seamus, into the national traditional music arena that was steadily gathering momentum. In 1970, at the young age of 14, Manus won Sligo’s prestigious Fiddler of Dooney competition. Since then, he has toured extensively in North America and Canada. Manus has recorded eight albums, including The Humours of Lisadell (Folk Legacy, 1980), and Carousel (Gael Linn, 1984),with Seamus; Buttons & Bows (Green Linnet, 1983), First month of Summer (Green Linnet, 1987) and Grace Notes (Gael Linn, 1991), all with the group Buttons & Bows; Moving Cloud (Green Linnet, 1994) and Foxglove (Green Linnet, 1997), with the group Moving Cloud; and a solo debut, Saffron & Blue (Green Linnet, 2000) This last recording was placed in the Top Ten polls of the Boston Globe and Irish Echo newspapers. It was also named Best Album of 2000–and Manus, Best Male Musician of the same year–by the Irish American News.